This page shows how to construct a triangle given two angles and a non-included side with compasses and straightedge or ruler. The given line segment AB is copied. See Copying a line segment. 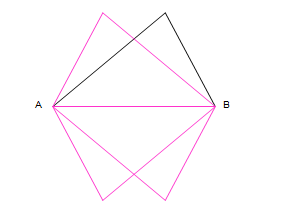 The given angle A is copied to one end of AB. See Copying an angle. The given angle C is copied to be adjacent to the angle A. This in effect adds A and C.
The third angle created at A must be the angle B because the three angles at A add to 180, so this is copied to the point B. This in turn establishes point C and the triangle is complete. The construction involves finding the angle B in the triangle. We know where this angle has to go (on the end of AB at point B), but we must first find it's measure. This is done by using constructions that add the given angles A and C, then subtracting the result from 180. Because the interior angles of a triangle add to 180, this must be the missing third angle B. 1 Triangle AB = given AB Copied using the procedure shown in Copying a line segment. See that page for the proof. 2 m∠CAB = m∠A Copied using the procedure shown in Copying an angle. See that page for the proof. 3 m∠CAD = m∠C Copied using the procedure shown in Copying an angle. See that page for the proof. It is possible to draw more than one triangle has the side length and angle measures as given. Depending on which end of the line you draw the angles, and whether they are above or below the line, four triangles are possible. All four are correct in that they satisfy the requirements, and are congruent to each other. Click here for a printable worksheet containing two AAS triangle construction problems. When you get to the page, use the browser print command to print as many as you wish. The printed output is not copyright.